When I was 25 years old, I was working full-time as a Montessori assistant in a Kindergarten classroom. During morning circle time, I would take little notes on our scrap paper about what the head teacher was sharing with the 5-7 year olds. No holds barred, this teacher, a life-long lover of learning, poured into these children rich details about complex ideas and precise nomenclature. I love the Montessori concept of the “Absorbent Mind” and respecting children to be capable of more than many people realize. I remember at the beginning of the school year thinking “How are these children going to remember what a calyx is?” But sure enough, come May one of my students identified it out in our school garden without anyone asking her to. My gift to this head-teacher at the end of the school year was a compilation of all of my scrap notes into a coloring book. 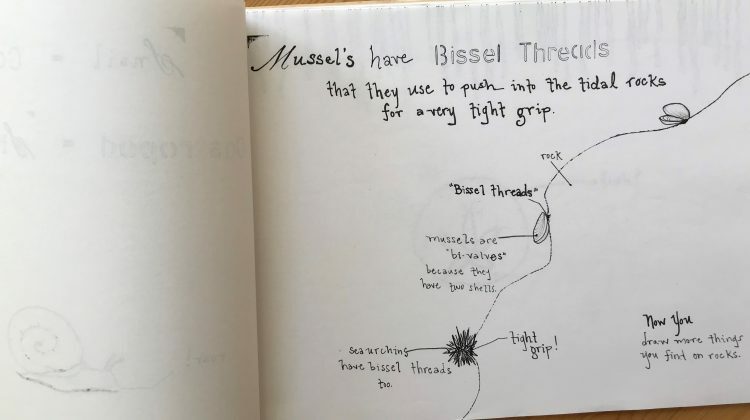 It was titled “What I learned in Kindergarten When I Was 25.” It included wonderfully random bits of information such as what bissell threads are and what Ganymede did. That year inspired me to pursue a certification in the Montessori method, and of course this influences how I raise my own three children. My three-year-old can easily recognize a calyx and many other random nomenclatures of nature, but more importantly, she has been encouraged to notice and pay attention to the beautiful details of our natural world. 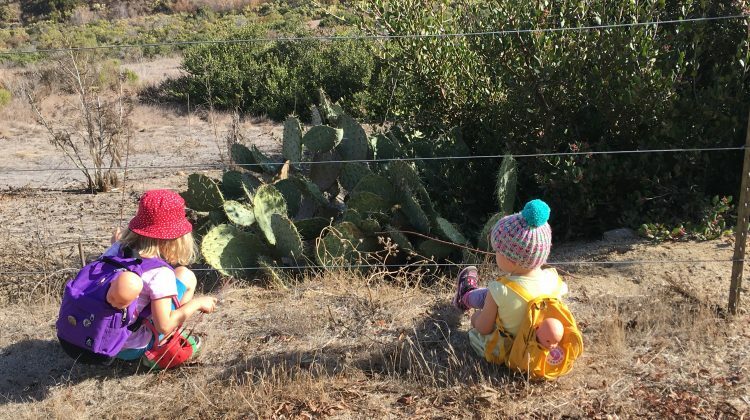 My two daughters have nick-named themselves “The Nature Hikers” and love days that include a walk where they bring their nature journals to draw and collect treasures from their environment. 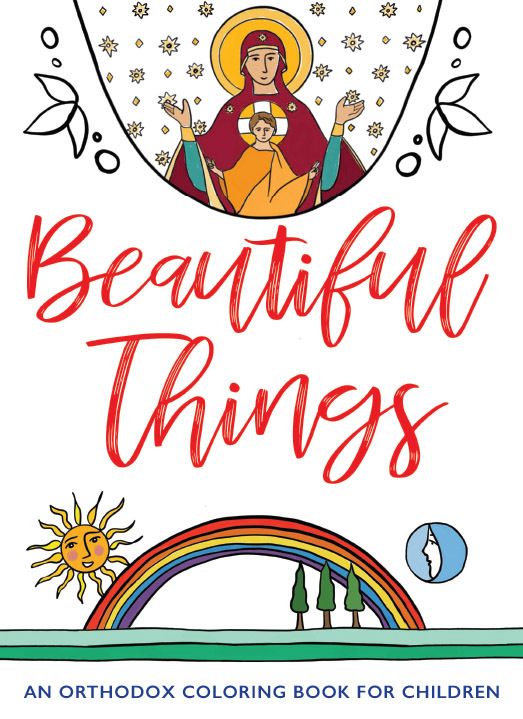 Beautiful Things, our new coloring book at Ancient Faith Publishing, is a culmination of these themes for me: inspiring awe and attentiveness in children (young and old) to the loveliness in our midst, and a respect for our littlest learners’ competence and abilities. I prayerfully considered each image, thinking about what my previous students, my own children, and even my adult artistic friends would enjoy coloring. 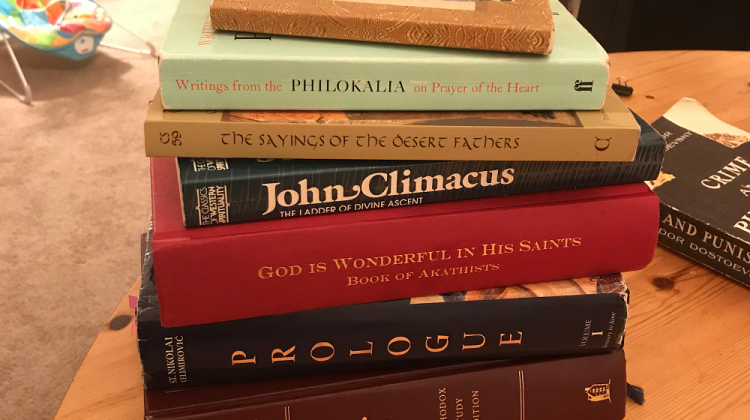 Balancing subject matter between the seen and the unseen, the tangible and the imaginable, the grounding and the inspiring, you will find everything from a bouquet of flowers to an angel, a chalice and the Jesus Prayer. Another thing that I learned from this mentor of mine when I was 25, was a method of teaching children how to draw called “Monart”. This method teaches the child to break down their subject matter, whether a still-life from the natural world or copying from a printed image, into a few basic universal shapes (straight lines and curved lines, basically). We encourage them to embrace their own drawing style and be open to it looking uniquely theirs, just as their own handwriting is uniquely theirs. We draw with sharpie (black permanent markers) on white paper, which prompts me to often say, “Remember, there are no mistakes in art, only opportunities to be creative!” The children learn to work with their “beautiful oops”, instead of giving up. A black and white coloring page is an invitation to be creative. The color-er has a myriad of choice to make: crayon, marker, pencils, colors, patterns, what to do with it when it is done, etc. But more than a creative outlet, I feel that the true benefit of a coloring sheet is the opportunity it provides to concentrate on the present moment, what is in front of them, to relax, slip into a moment of timelessness and just color. There is a sense of calm and accomplishment when the page is complete. I also cherish those sweet little moments drawing side-by side with a friend (big or little), and the ebb and flow of chit-chat and the whisper of the crayons on the paper. Some of the pages may even evoke deep questions and lengthy conversation. It is my hope that Beautiful Things will bring some of this to you and those you share it with. Happy coloring! Megan Elizabeth Gilbert is an Orthodox Christian illustrator and Montessori educator. She has lived, studied​, made art and taught in California, Arizona, Greece, British Columbia, and France. Along with the beauty of the natural world, her three imaginative children are the inspiration for her work. Besides drawing, painting, and collaging, she enjoys playing piano, riding a bicycle, and tending her garden. This looks wonderful! I will be ordering soon. I am a former Montessori teacher as well so love your perspective. Are you trained in the Catechesis of the Good Shepherd, Megan? If not, you would love it and be a wonderful catechist!